Sushi, eh? An irishfoodies cookalong recipe! Well it was a Friday evening. The first Friday of August. What else would we be doing but an (now regularly scheduled) irish foodies cookalong session. The theme: Seafood. Anything and everything that one could think of on a seafood theme. This is what becomes of discussing mussels on twitter! Well, being a recent sushi convert, there was but one thing for it. Eh.. sushi. Whaddyaknow. Now I am in a county that doesn’t necessarily have the best supply of sushi grade fish, and I knew I’d be on placement that day, so opted for the imitation crab and smoked salmon route. Oh and prawns. Only I forgot to buy them. So.. eh.. yeah.. Anyway, here’s what I had/got for the event. 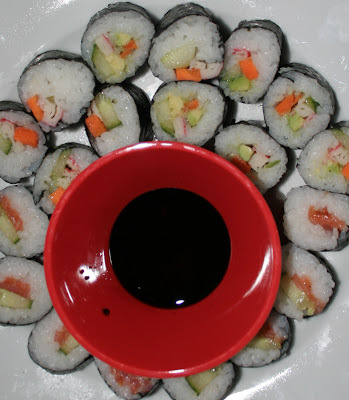 Tesco have recently started stocking sushi items but go to an asian supermarket if there’s one handy. And get wasabi peas and edamame beans while you’re there. 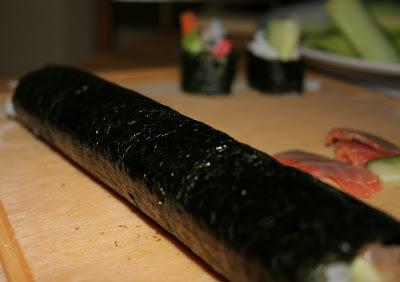 A sushi rolling mat (cover it in clingfilm to keep it all clean! Pickled ginger. If you’re gonna do it right! Filling ideas- julienne any of the following. Ok. Get the rice started. 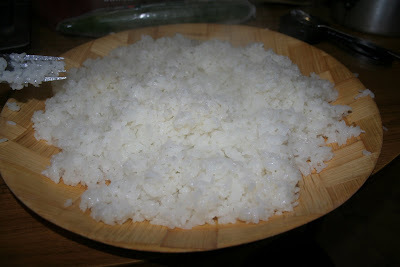 Put it in a bowl (a nice one, just for the hell of it) and wash out the rice a few times until the water runs clear. I cooked it according to the instructions on pack, but in a rice cooker. I love my rice cooker. It’s brilliant. Love love love. While thats cooking, mix your rice vinegar, sugar, and salt in a saucepan and heat over medium stove until all dissolved, but don’t let it boil. Set aside until you need. Then the awkward part. You need to get that vinegar mix on that and get the rice cooling off, so with one person it’s a bit difficult, but I managed it! Keep turning the rice over, drizzling the vinegar onto it so that it’s evenly mixed. If another person is there they can fan the rice to help it cool down. When the rice is cooled you are pretty much ready to go! Put out your mat. 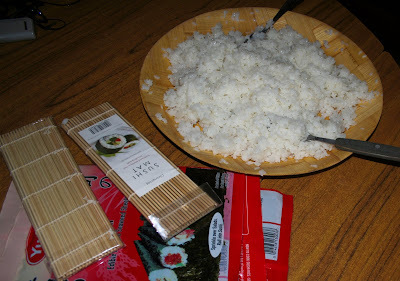 Get a wrapper and cover about half of it in a thin layer of rice. The rice is super sticky so keep a bowl of water there to rinse off your hands in. 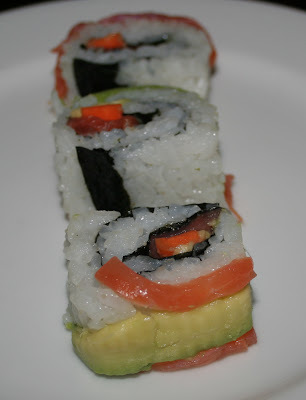 Choose what you’d like to put into your sushi roll. 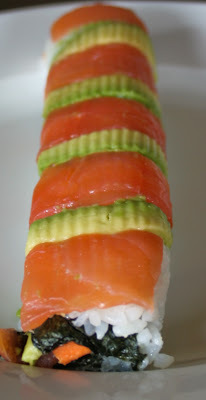 I put salmon, cucumber, avocado in- which I’ve heard is a Seattle roll! and put them in a little line on the rice. This is hard to describe- but you basically roll it a bit at a time, keeping it as tight as possible, and tuck it into the bottom every time. Really you need to be shown or watch someone. Or just experiment! So then you need to get a nice sharp knife. Cut it in two, and then cut each one into 3 or 4, depending on how stable it is! Like that! 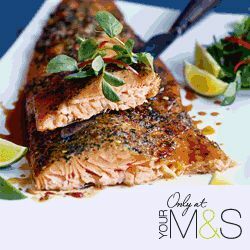 Serve with some wasabi paste, pickled ginger and a wee bowl of soy sauce. Heres a rubbish picture! Messy plate, I do apologise.. So now off you go and experiment with some fillings! I advise getting some lovely sushi grade tuna, it’s delicious! Are you a fan of sushi? If so what’s your favourite. And if not, would you try it? You make it look so easy! I still nominate you to head up a sushi-making class.